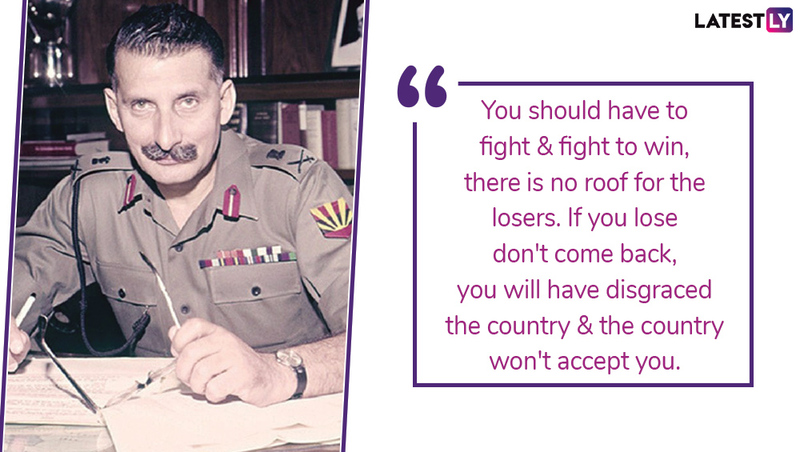 Sam Manekshaw 105th Birth Anniversary: Remembering Indian Army's 1st Field Marshal With His Memorable Quotes! 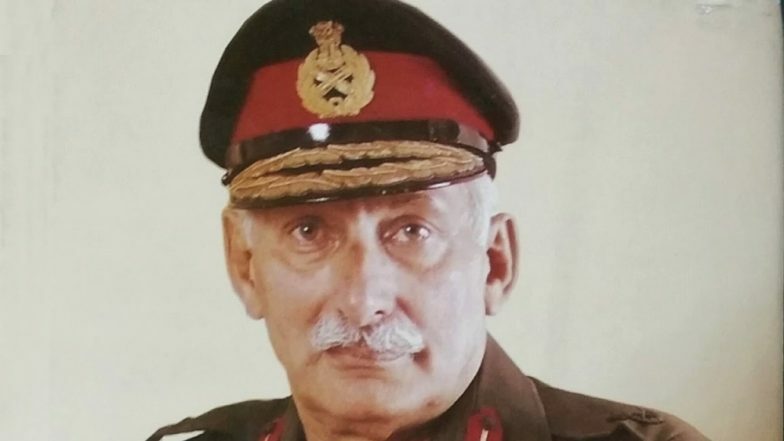 Brains behind India’s victory in 1971 war with Pakistan, Field Marshal Sam Hormusji Framji Jamshedji Manekshaw would have turned 105 on Wednesday. Famous by his nickname Sam, Field Marshal Manekshaw was the eighth chief of Army Staff of the Indian Army. 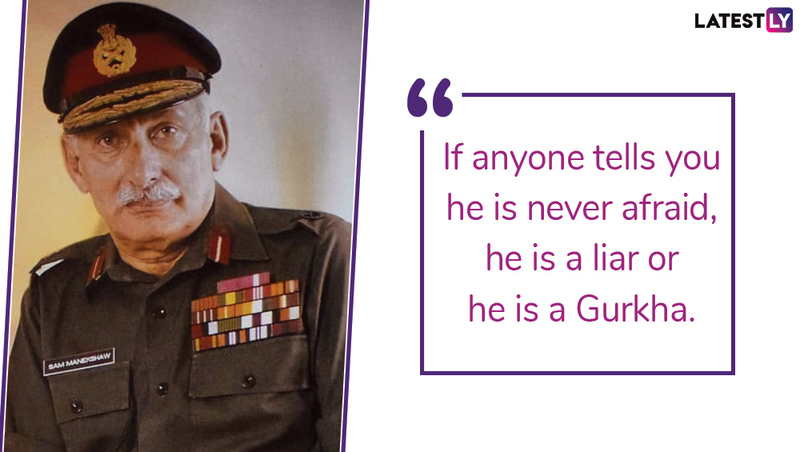 He is one of the most celebrated generals of the Army. Born in Amritsar on April 3, 1914, Field Marshal Manekshaw did his schooling from Sherwood College, Nainital. He was one of the pioneers of the Indian Military Academy (IMA), Dehradun. Field Marshal Manekshaw joined the Indian Military Academy on October 1, 1932, and was commissioned into the British Indian Army as the Second Lieutenant in 1934. During the World War II Manekshaw was awarded Military Cross for his gallantry. 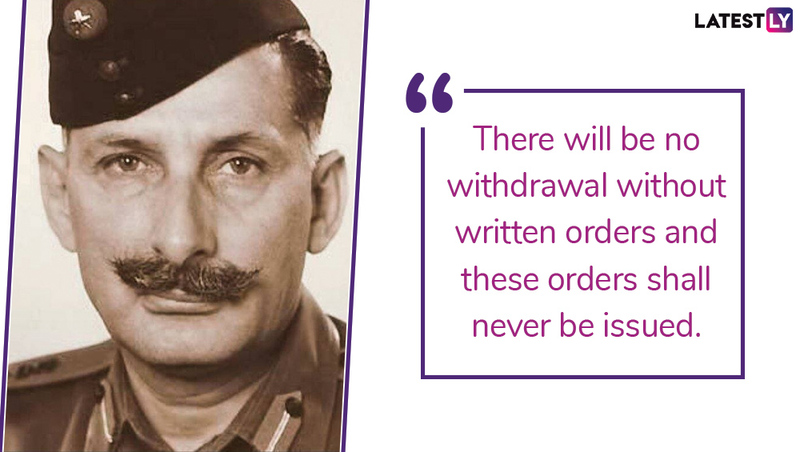 After the partition of 1947 Field Marshal Manekshaw was reassigned to the 16th Punjab Regiment. He displayed valour and battle skills during Jammu and Kashmir operations when the Pakistan Army along with Afghan fighters attacked Kashmir. 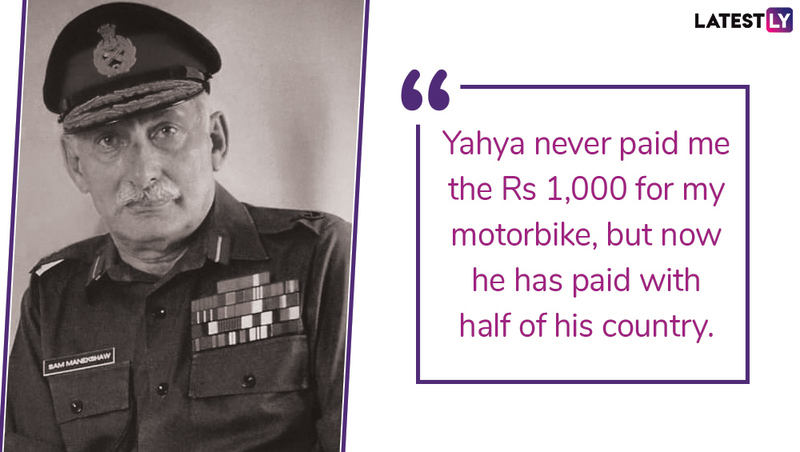 He was awarded Padma Bhushan in 1968 for handling the insurgency in Nagaland as the GOC- in – Eastern Command. After becoming the COAS, Manekshaw was given the task to formulate a plan to counter Pakistan’s aggression in the East. He devised war strategy which forced Pakistan Army to surrender and led to the formation of Bangladesh. In 1971 war almost 90,000 Pakistani soldiers surrendered. Will Ranveer Singh Reject Chhapaak Director, Meghna Gulzar's next Biopic on Field Marshal Sam Manekshaw? 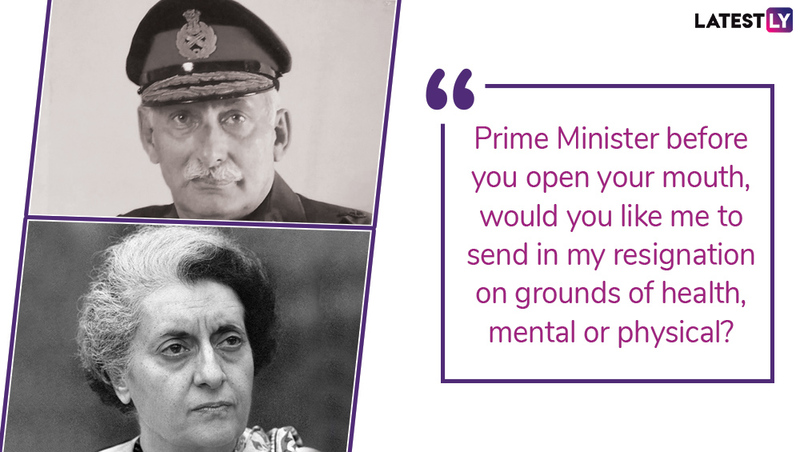 3) On the eve of the 1971 war, when Indira Gandhi asked about the Indian Army's preparation. In 1972 Manekshaw was awarded Padma Vibhushan. On January 1, 1973, he became the first General of the Indian Army to be promoted to the rank of Field Marshal. 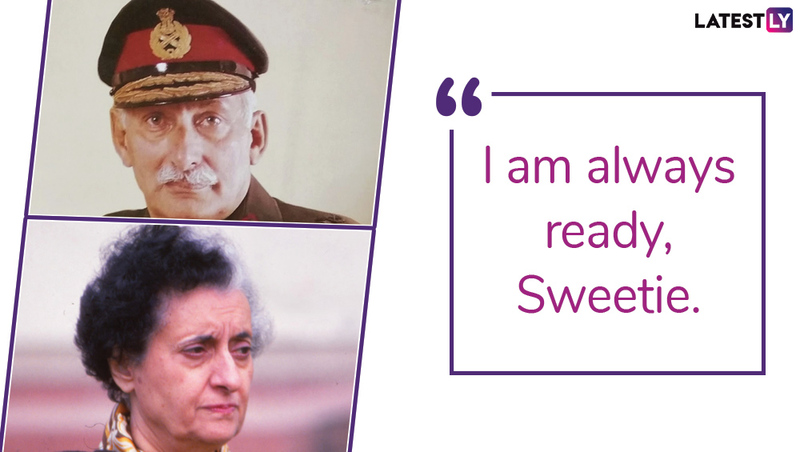 After serving for 39 years Field Marshal Manekshaw retired from the Indian Army. After retiring from the army he settled with his wife in Coonoor, Tamil Nadu. At the age of Field Marshal Sam Hormusji Framji Manekshaw died on 27th June 2008. 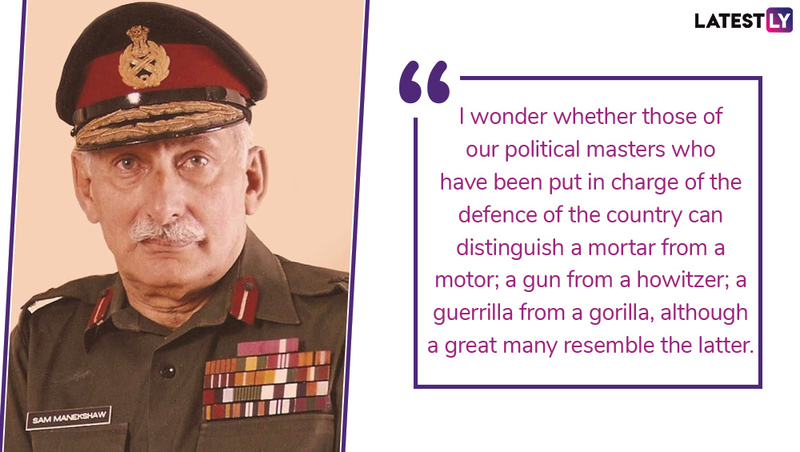 Field Marshal Manekshaw was also known for his jovial nature. On 16th December 2008, a postal stamp was released by the then President Pratibha Patil on Sam Manekshaw’s image marking the 37th anniversary of 1971 Indo-Pak war.